By Akash Jain. Akash is a Partner Solutions Architect (SA) at AWS. As a Partner Solutions Architect (SA), I work closely with APN Partners as they look to use AWS services in innovative ways to address their customers’ use cases. Recently, I came across an interesting use case with an APN Partner who configured an AWS Lambda function to access resources running in a custom virtual private cloud (VPC) to call an internal API over the virtual private network (VPN). In this post, I’ll walk through how this APN Partner is evolving an existing architecture to take advantage of AWS Lambda’s capabilities and to optimize the managed services they provide to their customers. For those who are new to AWS Lambda, it is a compute service that lets you run code (written up as “Lambda functions”) without provisioning or managing servers. These functions execute in response to a wide variety of AWS service events and custom events, and can be used in a variety of scenarios. AWS Lambda executes your code only when needed and scales automatically from a few requests per day to thousands per second. With AWS Lambda, you pay only for the requests served and the compute time required to run your code. The particular use case I’ll discuss today involves an APN Partner who needed to integrate a customer’s AWS environment with their own on-premises environment to provide managed services. Several VPN connections were set up between their on-premises environment and different AWS Regions. As a part of the integration, all system alerts in a region needed to be consolidated in one place. In this case, that was the APN Partner’s on-premises environment. 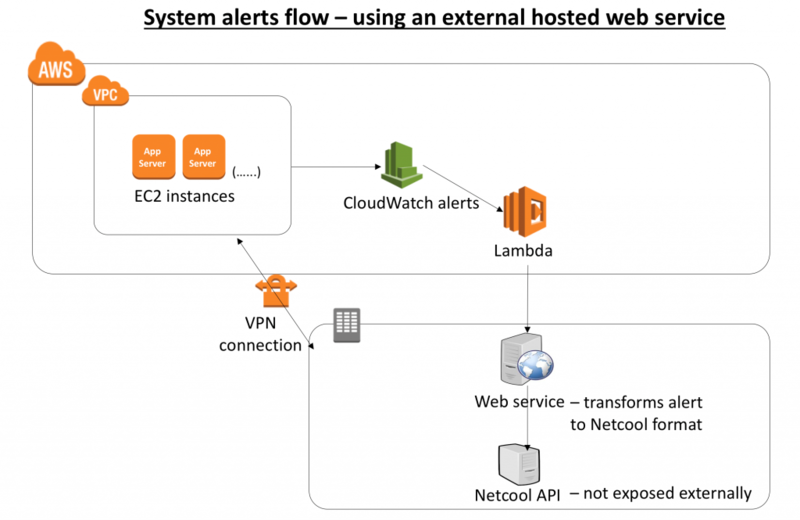 To make this happen, they set up Amazon CloudWatch alerts to trigger a Lambda function. The job of the Lambda function was to call an externally hosted web service and pass the alert as payload. The web service could then convert the CloudWatch alerts to a format that the Netcool API, which was hosted on premises, could understand. The following diagram outlines the setup of this architecture. For simplicity’s sake, I’ve chosen not to represent components like subnets, customer gateway, and VPN gateway. Extra cost – A dedicated system (VM) was in place to host the web service, and its job was to convert the message from the CloudWatch alert format to the Netcool API format. Getting the VM, OS, and other software in place required an upfront cost. Maintenance – Managing and maintaining this server added an extra layer of maintenance. The team had to patch the server regularly to keep it up-to-date. Security complexity – The API for converting the format was exposed externally, so it resulted in an additional security layer for authentication, authorization, and DoS/DDoS protection. Low scalability – The web service could not auto-scale because it was installed on a single VM. Fault tolerance – If the server went down, all the alerts would be lost. The answer is to access resources in a VPC from an AWS Lambda function, a helpful feature that was introduced by AWS in early 2016. With this feature, the AWS Lambda function can call the Netcool API over the existing VPN connection, which was established for secure administrative access. When the Lambda function accesses resources in a VPC, it gets a private IP address from the VPC. It can then communicate with any service within the VPC or with any other system accessible from that VPC. Manageability – The Lambda function automatically runs your code without requiring you to provision or manage servers. This means that your support team can focus on important system alerts instead of managing and maintaining the infrastructure around it. Minimized cost – You pay for what you use. For Lambda, you’re charged based on how many requests the Lambda function receives and how long your code executes. Since we’re working with system alerts in this scenario, I don’t expect the Lambda function to be more expensive than monthly charges for running a server. Security – Because the Lambda function is VPC-enabled, all communications between AWS and the on-premises environment will be over a secure tunnel. High scalability – Lambda can launch as many copies of the function as needed to scale to the rate of incoming events. Fault tolerance – Lambda can be a part of multiple subnets spanning multiple Availability Zones. Lambda functions automatically scale based on the number of events they process. For VPC-enabled Lambda functions, you should make sure that your subnet has enough elastic network interfaces (ENIs) and IP addresses to meet the demand. For details on calculating ENI capacity, see the AWS Lambda documentation. A Lambda function enabled to access resources within a VPC may take some time to instantiate, because an ENI needs to be initialized and attached to it. In the case of inactivity over a long period of time, the alerts may take some time to process. 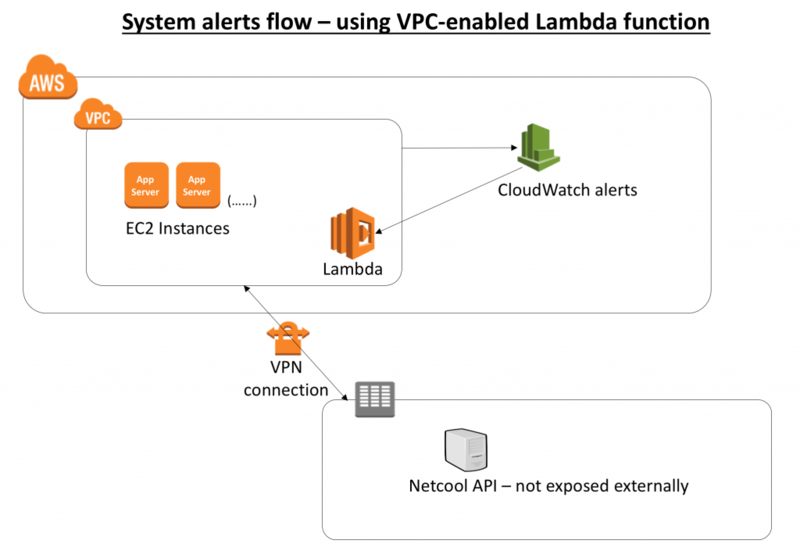 A workaround I suggest is to keep the Lambda function warm by triggering dummy CloudWatch alerts, as explained in a post on the A Cloud Guru blog. As the APN Partner in this example is a Managed Service Provider (MSP), I’d like to tie this example back to how next-gen MSPs can drive workload optimizations and cost efficiencies for their customers. Service delivery quality is a key value next-gen MSPs bring to customers. An essential goal for MSPs is to try to develop the tools, processes, and governance required to deliver reliable services cost-effectively. By accessing resources in a custom VPC from a Lambda function and leveraging an existing VPN connection, an MSP can send alerts more securely, reliably, and cost-effectively. In this post, we briefly discussed the benefits of running Lambda functions that can access resources inside your private VPC. Your Lambda functions can access Amazon Redshift data warehouses, Amazon ElastiCache clusters, Amazon Relational Database Service (Amazon RDS) instances, and service endpoints that are accessible only from within a particular VPC, such as resources over VPN. I recommend that you keep sufficient ENI and IP addresses under a subnet for auto-scaling purposes, and keep your Lambda function warm if you need a quicker response in case of longer inactivity. For more information, I recommend that you take a look at the AWS documentation. Do you have comments? Talk to me in the comments section. I’d love to hear from you. Ian Scofield is a Partner Solutions Architect (SA) at AWS. In a previous post in our series, we showed how to use an AWS CloudFormation launch stack URL to help customers create a cross-account role in their AWS account. As mentioned in an earlier APN Blog post, a cross-account role is the recommended method to enable access to a customer account for partner integrations, and creating the role using a CloudFormation template instead of following a long series of manual steps can reduce failure rates and improve the customer onboarding experience. 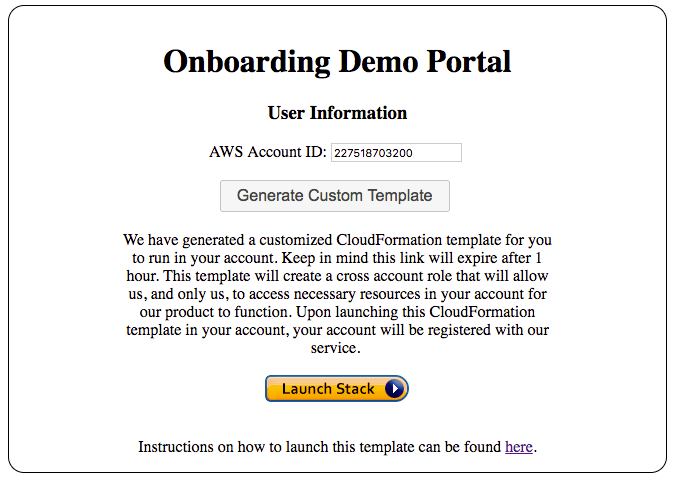 In this post, we will explore the use of custom CloudFormation templates to further streamline the onboarding process. Recall that the CloudFormation template in our previous example was static and required the customer to enter a 12-digit AWS account ID and an arcane value called an external ID. Of course, omitting or entering incorrect values results in a failed CloudFormation launch, or, worse, a useless cross-account role sitting in the customer account. Since we already know the values of these two parameters (the partner’s AWS account ID is the parameter we want the customer to trust, and the external ID is a unique value we generate for each customer), it makes sense for us to automate template creation and set these values ahead of time on behalf of the customer. The external ID is a piece of data defined in the trust policy that the partner must include when assuming a role. This allows the role to be assumed only when the correct value is passed, which specifically addresses the confused deputy problem. External IDs are a good way for APN Partners to improve the security of cross-account role handling in a SaaS solution, and should be used by APN Partners who are implementing products that use cross-account roles. For a deeper look into why external IDs are important and why APN Partners should use them, take a look at How to Use External ID When Granting Access to Your AWS Resources on the AWS Security Blog. There are many methods for setting default values in CloudFormation templates. We’ll discuss two of these. Keep in mind that although this blog post focuses on cross-account role creation, the method of populating parameters on the fly can be used for any other components within the template. Depending on the parameter in question, one of the methods we discuss might be a better fit than the other. The first method is to supply the partner’s account ID and external ID as the default values to CloudFormation parameters. The customer can inspect and potentially overwrite parameter values in the CloudFormation console before launching the template (Figure 1). In some cases, this level of transparency might be required so the customer is aware of the AWS Account ID they are granting access to. However, as noted previously, incorrect values will result in the CloudFormation stack failing to launch or associate correctly, so any customer modifications to these parameters are likely to result in a failure. The second method (Figure 2) doesn’t expose any parameters to the customer; instead, it hard-codes the partner’s account ID and external ID directly into the resources in the template. This helps ensure the successful creation of the role and association with the partner account, while removing any additional work for the customer. In both of these scenarios, how do you insert values that are unique for each customer into the template? In order for either method to work, you have to create a custom template for each customer with their unique values. This requires some additional steps in your onboarding workflow; however, the simplicity it provides to the customer and reduced chances of failure can outweigh the initial setup on your side. 1. Puts an entry with the account ID into an Amazon DynamoDB table. 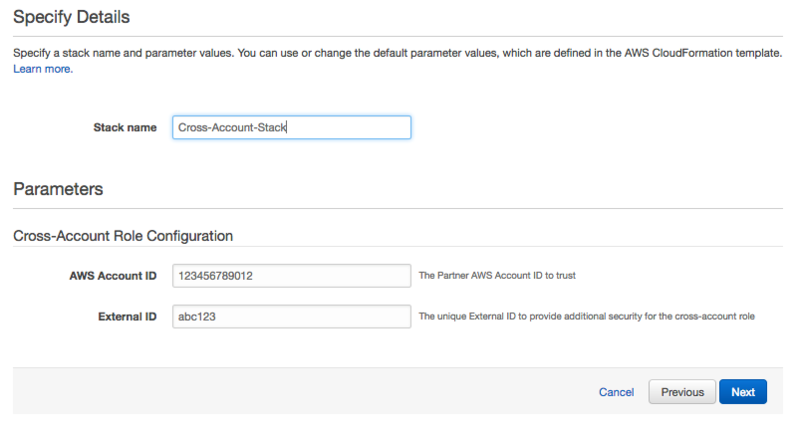 This allows you to track customers and associate the cross-account role we’ll create later with the AWS account ID. You can also store the external ID and any other information pertaining to the customer in the DynamoDB table. The Lambda function downloads the template and uses a simple replace() function to replace the placeholder strings with the unique values you’ve generated for this customer. 3. Uploads the customized template to an S3 bucket with the customer’s account ID prepended to the file name to correlate templates with specific customers. 4. Sends back the S3 URL for the custom-generated template, and then displays a Launch Stack button on the portal for the customer to begin the onboarding process. At this point, the customer clicks the Launch Stack button and begins the onboarding process for their AWS account. The stack creates the cross-account role with the provided policy embedded in the template, without the customer having to copy and paste policy documents and manually go through the role creation process. There are a few outstanding items that would make this solution simpler still. How does the partner get the Amazon Resource Name (ARN) for the cross-account role we created? What happens to the custom template in the S3 bucket? What if the customer tears down the template without notifying the partner? We’ll continue to expand on this topic through future posts. See post 3 in our series here. By Carmen Puccio and Mandus Momberg. Carmen and Mandus are AWS Partner Solutions Architects focused on Migration. It’s no secret that migrating software and services from an on-premises environment to the cloud entails unique considerations and requirements. To provide confidence in the outcome of your migration, your migration strategy needs to scale easily. This means that a large part of your workflow must be automated. There is no shortage of documentation on why automation in the cloud is important. In this post, we will show you how to perform an automated migration utilizing AWS Advanced Technology Partner CloudEndure, with a focus on incorporating automated tests so you can be confident that your application is working as expected post-migration. The migration of a workload from on-premises to AWS requires careful planning and precise execution. There are many different strategies for moving to the cloud, and there are also numerous tools that help facilitate migration. All migration tools share common goals: to facilitate a migration to AWS by minimizing downtime and application workload impact, and to ensure that data loss is minimized. Erin McGill co-authored this blog with Mike Ruiz. Both Erin and Mike are AWS Partner Solutions Architects. Amazon Simple Storage Service (Amazon S3) provides a secure, durable, highly scalable, and simple way to store your object data. It’s easy to create new buckets to contain data, and to store and retrieve any amount of data from those buckets at any time, from anywhere on the web, so the number of buckets and objects stored in an S3 account can quickly become substantial. To help you manage objects during their lifetime, AWS has developed lifecycle configurations for S3 buckets. If you are not familiar with S3 lifecycle rule creation, we recommend that you read Jeff Barr’s blog post on creating the lifecycle rules in the console. Jeff’s post walks through applying the multipart upload and deleting markers for expired objects. In this post, we’ll go beyond manual operations and explore automation for enforcement of S3 default policies. Why automate policy management? An APN Partner recently asked us, “How can we apply S3 lifecycle rules across all our S3 buckets in connection with IT-directed requirements?” In the example from this APN Partner, their IT department wanted to have the AbortIncompleteMultipartUpload rule applied to all their S3 buckets, regardless of when the bucket was created. This APN Partner works with large objects (objects larger than 5 GB), and uploads hundreds of these objects every day across hundreds of S3 buckets by using the multipart upload API. They explained that manually operating their scaled environment was very time consuming and prone to error and waste, so to we set to work identifying all the steps required to automate the process. The maximum size for a single upload of an object in Amazon S3 is 5 GB. To store larger objects (up to 5 TB), you use the multipart upload API to split objects into smaller components and upload them independently or in parallel. When using the multipart upload API, the application interacting with S3 starts by breaking the large object into smaller parts. Next, it initiates a multipart upload to a specific bucket and provides a name for the final object, uploads all parts, and then signals completion of the multipart upload by sending a successful request to S3. Upon receiving the successful request, S3 assembles all the parts and creates the final object in the bucket. S3 stores the parts until it receives the successful request or until the job is aborted, and then frees up the parts storage. If S3 doesn’t receive a successful request, the object parts are stored in the bucket and are not visible in the console, but still incur a cost. To see any stored object parts, you can use the list-parts S3 API call. To delete the object parts that are left over from an incomplete multipart upload after a specific number of days, you can set a lifecycle rule with the AbortIncompleteMultipartUpload action. It’s important to understand if a policy, or multiple policies, are already applied to the whole bucket or to a subset of objects within the bucket. The subset is defined by a policy prefix, designating an S3 bucket directory location or the beginning of an object name or key. For example, if the prefix is xyz, the rule applies only to the objects whose key name begins with the xyz string. If a prefix is not stated, the policy is applied to the whole bucket. This limitation is the same regardless of whether you’re applying a lifecycle rule through the command line or programmatically. If you want to be able to programmatically apply your default bucket lifecycle policy, you should keep this in mind, as this error will stop the rule from being applied to the bucket. Automating enforcement of a default bucket policy is beneficial to many APN Partners and customers as manually applying a policy to every S3 bucket can be a daunting task and possibly prone to error. While there are many ways to automate enforcement of a default bucket policy, we are going to walk through doing so by creating a scheduled AWS Lambda function. For those who aren’t familiar with it, AWS Lambda is a compute service that lets you run code (written up as “Lambda functions”) without provisioning or managing servers. These functions execute in response to a wide variety of AWS service events and custom events, and can be used in a variety of scenarios including big data processing and automation scenarios like these. In this scenario, for the Lambda function, you can use Boto3, the Python SDK, and your AWS account. Using the SDK, you can easily interact with the AWS S3 API. Boto provides an easy to use, object-oriented API, as well as low-level direct service access. The Lambda function will read a default configuration file in a designated policy bucket , and using the S3 API, check the lifecycle policies applied to all buckets, and verify that the action is applied in the policy. If the configuration is missing, then it will apply it. If there is a variance, it will log an error. The Lambda function can be scheduled to execute at a certain time interval to periodically run to ensure that all new buckets created in your account will have the default lifecycle policy applied even if the creator neglects to apply the policy when creating the bucket. Applying a lifecycle policy using the S3 API will replace all bucket policies already applied to the S3 bucket. The documentation for the put_bucket_lifecycle_configuration states, “If a lifecycle configuration exists, it replaces it.” Whatever you put in the bucket via the SDK will overwrite any existing lifecycle configuration. Because of this limitation, we need to check all buckets and see if they already have a policy applied. If they do, then the policy applied needs to be taken into consideration when applying the default bucket policy. send all future requests to this endpoint. To resolve this issue, you can make two connections to the S3 client API: one to get a list of all the buckets in the account, and the other for all subsequent requests that include the LocationConstraint as the region argument. By doing so, you are always sending the request using the specified endpoint as required by the API. However, when working with a bucket in the STANDARD region, the location constraint returned is None. We need to check the location constraint for values. If None is returned, we will replace it with us-east-1. There are no policies applied to the S3 bucket. There are some policies that are applied, but they apply only to prefixes within the bucket, and do not match the action from the desired bucket policy within those policies. There are some policies that are applied, but they apply only to prefixes within the bucket, and one of the actions matches the desired action. There is a whole bucket policy (where Prefix = ”), and the desired action is not applied. There is a whole bucket policy and the desired action is applied, and its value is equal to the desired action value. There is a whole bucket policy and the desired action is applied and its value is not equal the desired action value. If you want to automatically apply the desired action by default to all S3 buckets, then you need to consider all six of these possibilities. AbortIncompleteMultipartUpload, ID, Prefix, and Status. Since each bucket lifecycle policy can have multiple rules, you must check each rule and compare it to the desired rule. In this case, you can ignore the ID of the rule, as it is optional and has no effect on the rule itself. You can assume that the Status for all applied lifecycle rules is Enabled. If policies exist in the bucket, you can verify that the desired policy is applied, check for potential conflicts, and identify the bucket as a candidate for policy update. To get around this error, create an exception to catch ClientError and keep track of buckets that have no lifecycle policies applied. Check if the bucket has the desired action. In this example, the action is AbortIncompleteMultipartUpload. If the bucket has the desired action, then check the value. If the value doesn’t match, log a message of the mismatch. If the value does match, check the policy Prefix value. If Prefix = '' for the policy, then the default policy has been applied to the whole bucket. This is the desired state. If Prefix has a value, then log a message because there is a conflicting lifecycle policy applied to a subset of objects within the bucket. If the bucket has policies that do not match the desired default action, then check the Prefix value for each policy. This value will determine how the new lifecycle policy rule list to apply to the bucket is generated so it is in the desired state. If there is a prefix value, then append the desired action to the Rules dictionary. If Prefix = '', then add the action to the existing whole bucket policy. Now, you want to apply the default whole bucket policy to those buckets that do not have overlapping or conflicting policies. Because putting a lifecycle configuration via the SDK overwrites existing lifecycle configurations, simply using the put_bucket_lifecycle_configuration method without any logic will remove any previously applied bucket lifecycle configuration. If there is a bucket policy that already exists for a prefix that also contains the desired action or has the wrong value for the desired action, log a message to request a manual review of these bucket lifecycle configurations. There can be a valid reason why the bucket policies are different from the desired default, so this will give you a chance to highlight the differences and easily review them. To be able to apply the default action to existing lifecycle policy applied to the whole bucket, you can compare the keys of the applied whole bucket lifecycle rule to the keys that are in the desired default policy. Once you find the key that is in the default rule but missing from the applied rule, we can add it to the applied bucket rule dictionary. You can check to see if each key in the desired default policy exists in the currently applied policy. If missing, then we can add the key and value to the dictionary whole_bucket_lifecycle_rule[action] = desired_policy[action]. Your scheduled Lambda function updates buckets with the desired default policy where it was straightforward to do so, as well as logs a list of buckets that weren’t able to be updated due to an incorrect value or where an action was already applied to a subset of objects. In this post, we’ve walked through various S3 lifecycle policies, how to deal with pre-existing policies on buckets across various regions in AWS, and how to automate the application of lifecycle policies across hundreds of buckets, specifically focusing on the AbortIncompleteMultipartUpload action. We hope you’re able to use this information to optimize the management of multipart uploads as you scale. For more information, we encourage you to visit the S3 documentation page. Christopher Crosbie was also a contributor on this post. In his new book, The Death of Cancer, world renowned oncologist Dr. Vincent T. DeVita Jr. laments: “… it illustrates what has been, for me, a source of perennial frustration: at this date, we are not limited by the science; we are limited by our ability to make good use of the information and treatments we already have.” This frustration with the sluggish pace of technology adoption in healthcare is uncomfortably familiar. To make matters worse, illegal access of medical records continues at an alarming rate; as the Financial Times reported in December 2015, over 100m health records were hacked in 2015. Not only have we been slow to employ new technologies, we have also come to tolerate a surprising dearth of privacy. In this post, we will explore some ways AWS partners can use AWS orchestration services in conjunction with a DevSecOps methodology to deliver technology solutions that help to optimize healthcare while maintaining HIPAA compliance to safeguard patient privacy. Let’s start with HIPAA-eligible services and how they can be used together with orchestration services for healthcare applications. Customers who are subject to HIPAA and store Protected Health Information (PHI) on AWS must designate their account as a HIPAA account. Customers may use any AWS service in these accounts, but only services defined as HIPAA-eligible services in the Business Associates Agreement (BAA) should be used to process, store, or transmit PHI. AWS follows a standards-based risk management program to ensure that the HIPAA-eligible services specifically support the security, control, and administrative processes required under HIPAA. Using these services to store and process PHI allows AWS and AWS customers to address the HIPAA requirements applicable to our utility-based operating model. AWS is constantly seeking customer feedback for new services to add to the AWS HIPAA compliance program. Currently there are nine HIPAA-eligible services, including Amazon DynamoDB, Amazon Elastic Block Store (Amazon EBS), Amazon Elastic Compute Cloud (Amazon EC2), Amazon Elastic MapReduce (EMR), Elastic Load Balancing (ELB), Amazon Glacier, Amazon Relational Database Service (RDS) (MySQL and Oracle engines), Amazon Redshift, and Amazon Simple Storage Service (Amazon S3) (excluding Amazon S3 Transfer Acceleration). Just because a service is not HIPAA-eligible doesn’t mean that you can’t use it for healthcare applications. In fact, many services you would use as part of a typical DevSecOps architecture pattern are only used to automate and schedule automation activities, and therefore do not store, process, or transmit PHI. As long as only HIPAA-eligible services are used to store, process, or transmit PHI, you may be able to use orchestration services such as AWS CloudFormation, AWS Elastic Beanstalk, Amazon EC2 Container Service (Amazon ECS), and AWS OpsWorks to assist with HIPAA compliance and security by automating activities that safeguard PHI. Let’s walk through a few example scenarios using AWS Elastic Beanstalk, Amazon ECS, and AWS Lambda to demonstrate how AWS partners have used orchestration services to optimize their healthcare application to meet their own HIPAA eligibility requirements. Consider an internal-facing IIS web application that is deployed using AWS Elastic Beanstalk. Let’s start with a simple AWS CloudFormation template that does a few things for us (the template uses one Availability Zone for illustration). First, it sets up an Amazon VPC so that EC2 instances launched in this VPC are launched with their tenancy attribute set to dedicated. It then creates a public subnet and a private subnet with the necessary routing and networking components so that instances in the private subnet can connect to the Internet as needed. Now we have a logical network where we can launch Dedicated Instances so that they are only accessible internally. Assuming we also have an Amazon EBS snapshot that we can use as the base image for our encrypted EBS volume and the Elastic Beanstalk application bundle that we wish to deploy, we can use an AWS CloudFormation template to easily set up this application. First, we set up a new Elastic Beanstalk application (we could also use the .NET Sample Application from the AWS Elastic Beanstalk tutorial); then, we make our bundle available as an application version; finally, we launch an Elastic Beanstalk environment so we can interact with our new web service that needs to process PHI. We would also configure the Elastic Load Balancer for end-to-end encryption so secure connections are terminated at the load balancer and traffic from the load balancer to the back-end instances is re-encrypted. Another option here would be to have the load balancer relay HTTPS traffic without decryption, but then the load balancer would not be able to optimize routing or report response metrics because it would not be able to “see” requests. Note how we used the power of AWS CloudFormation and Elastic Beanstalk but left our application (which is running on EC2 Dedicated Instances with encrypted EBS volumes) with the responsibility to store, process, and transmit PHI. The new application is visible on the Elastic Beanstalk console with a URI for the load balancer. We then log into the Bastion host and use the browser there to confirm the application is running. In this second scenario, we look at Amazon EC2 Container Service (Amazon ECS) and Amazon EC2 Container Registry (Amazon ECR). Consider a PHP application that runs on Docker. Since ECS is only orchestrating and scheduling application containers that are deployed and run on a cluster of EC2 instances, ECS can be used under the AWS BAA because the actual PHI is managed on EC2 (a HIPAA-eligible service). We must still ensure that EC2 instances processing, storing or transmitting PHI are launched with dedicated tenancy and that PHI is encrypted at rest and in transit. In addition, we must ensure that no PHI leaks into any configuration or metadata such as a task definition. As an example, this means the definition of what applications to start must not contain any PHI, and the exit string of a failed container must not contain PHI as this data is persisted in the ECS service itself, outside of EC2. Similarly, we can use ECR to house our Docker images as long as we can ensure that the images themselves do not contain any PHI. As an example, images that require cached PHI or PHI as “seed” data must not be added to ECR. A custom registry on dedicated tenancy EC2 instances with encrypted volumes might serve as an alternative. We followed the Getting Started Guide to create the IAM roles that are required and then created a repository for Docker images. This AWS CloudFormation template creates a VPC with dedicated tenancy for use with ECS, a private subnet, and a public subnet. It creates the corresponding route tables, Internet gateway, and managed NAT gateway. It also adds the appropriate network routes. Then, it creates an ECS security group for container instances in the VPC. Finally, it creates a Linux bastion host. For illustration, we also use this instance as our Docker-admin instance to manage Docker images (you can, of course, build and manage Docker images in other ways). Next, we created a Docker image for the application. $ docker build -t aws-phi-demo . We pushed the image so it became available in ECR. This AWS CloudFormation template creates an ECS cluster with an internal-facing load balancer. It then uses the ECR reference to set up a task definition and a service for the Docker image that has been provided. Finally, it sets up a launch configuration and an Auto Scaling Group to launch some container instances to host the application. Note: Container instances are created with encrypted volumes, so data is protected at rest (Docker creates LVM volumes from the EBS volumes provided). We created an internal-facing application, so we used the Docker-admin instance to confirm it’s available. As with the previous example, we see how another set of orchestration services helps to automate application activities while relying on HIPAA-eligible services to store, process, and transmit PHI. Consider the scenario where PHI is posted to an S3 bucket and we need an application similar to the ones above to process the data and store results back to S3. Can we use S3 event notifications with a Lambda function? Yes, we can, as long as the Lambda function does not store, process, or transmit PHI. Let’s start with a bucket. aws> s3 cp ip-ranges.json "s3://phi-demo/"
aws> s3 cp --sse AES256  ip-ranges.json "s3://phi-demo/"
aws> s3api head-object --bucket phi-demo --key "ip-ranges.json"
aws> s3api put-object --bucket phi-demo --key "data/"
Then, we need to set up a new Lambda function that is invoked when an object is added to the bucket. When a new object is added, the function is invoked and the corresponding PHI service is invoked. Use CloudWatch Logs to confirm that the function executed successfully. We have just reviewed three simple examples of how HIPAA-eligible services can be used with orchestration services to safeguard patient privacy while delivering solutions that can help optimize healthcare applications. AWS partners have tools at their disposal to address the need to manage HIPAA-compliant workloads. Healthcare customers should not fear non-eligible services just because they are non-eligible. Some services don’t typically interact with PHI so they may not need to be “eligible”. DeVita, Vincent T., and Elizabeth DeVita-Raeburn. The Death of Cancer: After Fifty Years on the Front Lines of Medicine, a Pioneering Oncologist Reveals Why the War on Cancer Is Winnable–and How We Can Get There. Page 32. New York: Sarah Crichton Books; Farrar, Straus, and Giroux, 2015. Scannell, Kara, and Gina Chon. “Cyber Security: Attack of the Health Hackers – FT.com.” Financial Times. N.p., 21 Dec. 2015. Web. 05 July 2016. Note that this post is not intended to guarantee HIPAA compliance – customers should ensure that any AWS services are used consistent with their HIPAA compliance programs, that risks are addressed in their risk analysis and risk management programs, and that they consult with qualified HIPAA counsel or consultants when appropriate. Today, Advanced all-in APN Technology Partner Sumo Logic, also an AWS Big Data and Security Competency Partner, made its App for AWS Lambda generally available and introduced a purpose-built Lambda function, which is immediately available for launch in the AWS Blueprint library. My colleague Bryan Liston wrote a great blog post about the launch over on the AWS Compute Blog. Click here to check it out, and learn more about how the Sumo Logic App for AWS Lambda works. Our friends over at Sumo Logic also issued a press release on the launch, which you can read here.